My knee seems to be getting better. The knee pain definitely hurts more in the mornings then eases as the day goes on. However, it's been hurting less and less each day. You can't argue with that. It's been just over three weeks since I first noticed pain and it's been about 10 days since I stopped running...aside from last Saturday when I foolishly raced the GW B-day 10k - that definitely delayed my recovery. I've been icing 2x a day and getting some light stretching in. I attempted to water run earlier this week, but that also irritated my knee...likely because I was still making the knee "motion" under water. Water running definitely helps with "impact" (shin/feet) injuries, but not as much with "motion" injuries. I've nixed any other attempts to cross train. Rest is likely the only aid in recovery. The plan now is to start up on Monday; ease back all next week then go full bore starting next weekend. Again, I can run with my knee pain, but the goal was to take time off NOW rather than make the issue worse and take time off in mid-March. I hope the gamble will pay off. Either way, I plan to press forward with the utmost efficiency by early March. Double sessions are scheduled to start in a few weeks. The time is now and if I am to take on Cherry Blossom and Boston no-holds-barred-style, I can't delay anymore in my training. If I end up in a wheelchair after the marathon, so be it. 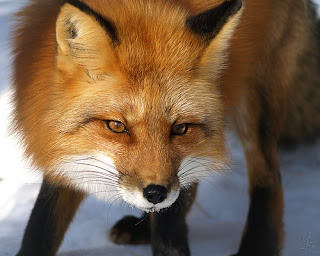 The eyes of the red fox are hungry and damn determined. I look forward to seeing everyone on the trails/roads. PS - I've already started thinking about the fall. I, like many, try and peak during the transition seasons of spring/autumn and have Army 10 Miler, Philly Distance Run (Half Marathon) and maybe...maybe Marine Corps on my schedule. Not to mention some short/small races. don't be a fool and do any serious damage. see a doctor to at least get some educated opinion on the matter. even a red fox knows when to hold back so as to hunt and do his thing for another day. fingers are crossed for a 9 week blast off straight to boston! and I like a lot of your fall plan. I may do something like twilighter, try to make the club team in august, maybe rock 'n roll 1/2 down in williamsburg, then marine corps. with XC nationals being in the area... marine corps might be a tough on. Glad to hear the knee's getting better. As for the summer/fall, I'm thinking Mt. Washington Road Race (anyone else interested in that? ), RnR 1/2 (in VA beach, no? ), and maybe a nice fall marathon like NYC or Richmond again. Also various 5Ks, 10Ks, shorter stuff. Good to hear about your knee getting better! Thanks. I might be game for the Mt Washington Race. I have a place to stay in NH.